Congratulations to the brilliant winning entries of our 'To The Women I Know' exhibition that celebrates East London women and the work they do for our community. Made In Hackney is a charity and award winning community cookery school. Launched in 2012, the project has helped over 6,000 Londoners lead healthier, happier lives - 70% of these participants from the East End. We run life-changing food growing and cookery classes and inspire people to eat local, seasonal, organic (when budget appropriate), and 100% plant-based food. The project works with vulnerable young people, low income families and individuals, migrants, people with long term health issues, people with learning disabilities and many other groups. Baby Anishka (Agathe’s daughter) - our gorgeous contributor to our team meetings and celebration events! This is Bunmi, a strong young woman who moved to London 3 years ago from her native Australia. Whilst working full-time in a stressful corporate environment, she spends her spare time organising fundraising activities, participating in marathons for charities or coordinating collections of items and food for disadvantaged people. On top of that, she finds time for everyone, although I can tell she would appreciate if the day had 30 hours instead of 24! She does everything without losing her sense of humour, her smile and her energy. So I think, as her friend, I need to show everybody that she is a superwoman in a mad world. It is the least I can do to thank her! This photograph shows Fizzie Lizzie in her pink suit. She features as part of Clown Time, a photography project about exploring the person behind the character. I only photograph female clowns, and this project has taken me across Britain for the last 2. She lived in London for most of her life until recently, when she was priced out of the city. She has been a clown for over 40 years and told me that she "was a young woman doing something which was quite unusual. Most of the entertainers were men and they weren't that welcoming to the profession ... But I did find that I got a tremendous amount of support from women." Clowning is not an especially well-paid career; she works because of her passion to provide laughter to others. Meeting Fizzie Lizzie really touched me, she is such an incredible woman who has done so much to help people. She is funny, beautiful, inspiring and doing something true to herself. Laura Villegas is a Colombian lawyer and a teacher, who has been living in London since 1998. Laura has been through an educational process within the popular struggles in the UK where she has been involved for the past 20 years. This proximity to her as a political person and to the struggles, has positioned her as a vanguard within her community. Laura works at the Indo-American Refugee and Migrant Organisation (IRMO) as a legal adviser in immigration matters. In her day-to-day work, Laura finds in people a shared hope and resilience to keep walking towards her utopia of having a world that is borderless. Laura is also a painter who passes her knowledge to the younger children of IRMO. Her outstanding contribution to her community has led to her achieve the Community Worker of the year award by The Lukas Awards 2015. Jolly by nature, full of energy and always with a smile for everyone, Amy (in addition to her job in a NGO) is a passionate Amnesty International member and activist, who campaigned heavily on their two-year ‘STOP TORTURE’ campaign, focused on targeting five countries where torture is used, and lobbying the governments of those countries. Her most recent pet project is being involved with ‘Sutton Coldfield International Development Group’, or SCIDG, a local group of concerned citizens who aim to raise awareness locally about international poverty levels. Amy says: “As UK taxpayers, we do not want our taxes to be used to cause harm to local people in other countries whilst benefiting multinational corporations. The ‘#FreeTheSeed’ campaign has been launched in opposition to this situation, promoting alternative farming methods, including traditional agroecological techniques and practices”. This is Sabera Ahsan - policy advisor, script writer, counter-terrorism expert, diversity and equality freelance trainer. Sabera is a woman full of energy who recently decided to leave her position as a civil servant in order to devote all her time and motivation to creating a charity, the Alhambra Women Network. They aim to empower women from Asian backgrounds, a community that has historically faced constraints on their personal freedoms. Currently, the main project Sabera is running through her charity is an online magazine, which she hopes will become the Time magazine for Asian women. 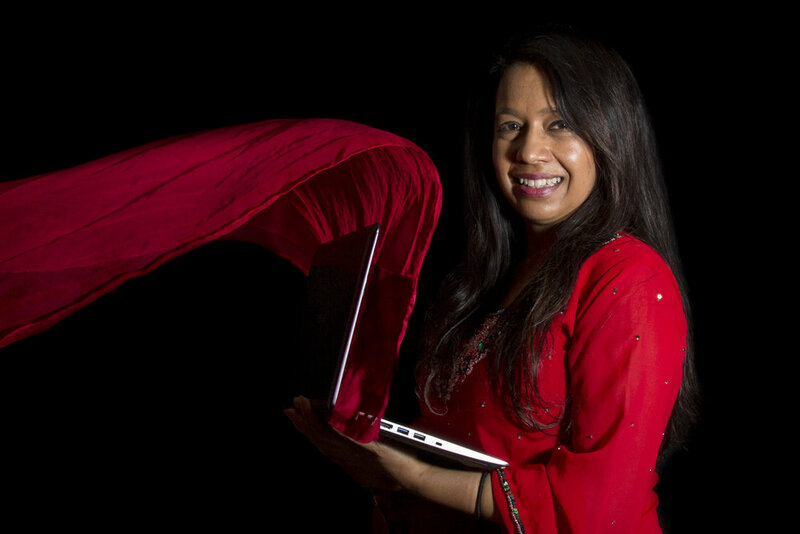 Working from her home in South London, Sabera aims her online magazine to become a window to the world for the global audience of Asian women, and a virtual meeting place to exchange experiences and stories. After facing health issues that prevented her from continuing working, Donna decided to put into practice a personal project that she had been thinking about for a long time. To try to help the ever-growing number of homeless people in Tower Hamlets and surrounding boroughs. 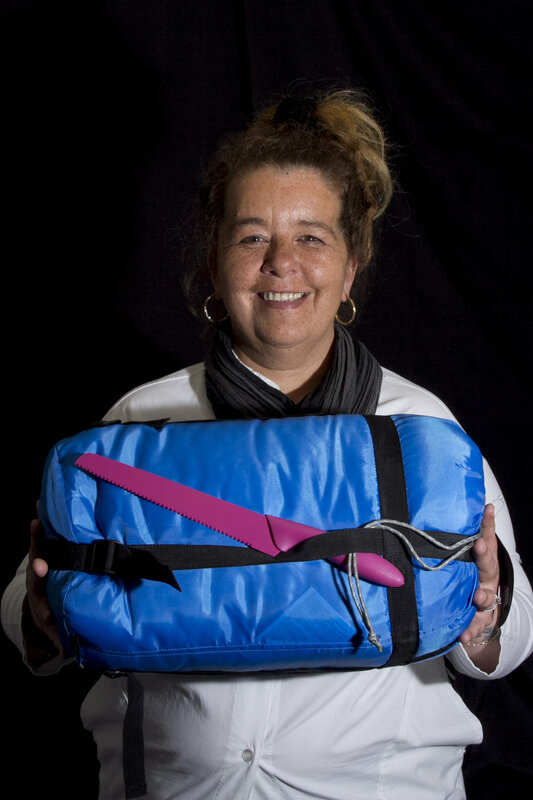 Donna, alongside her friend Tracey and their team of volunteers, deliver home-cooked food, clothes, tents, and sleeping bags to homeless people currently living in shelters or on the street. Despite not being a licensed charity, it is very clear that the social role she plays makes her a role model for the community. Her effort and motivation have been rewarded recently with an honorary award from DLR as a Community Champion. Anna is a very active woman who loves travelling and does not like standing still or wasting her time. Currently living in London, she became aware of how important appearance can be when looking for a job in this city. Having gone herself through a hard time when looking for a job, she decided to try and ease that experience for others in the best way she could. 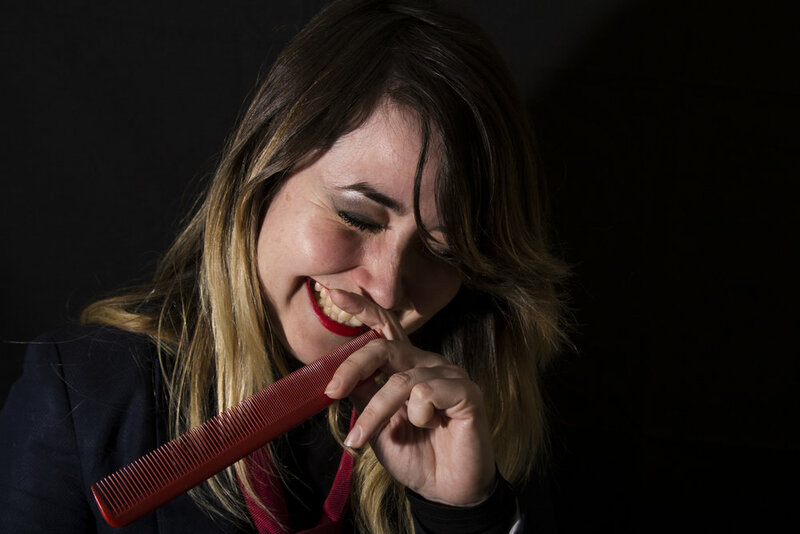 She decided to offer her hairdressing services for free to those actively looking for a job, aiming to not only to look help them to look sharp, but also to increase their self-esteem. This is the amazing Linda Cremin, born and bred locally, and fiercely proud of her neighbourhood. She is special because she loves sharing her skills and has spent a number of years working in adult education, both in and out of the borough. She has many talents including belly dancing, playing in a band, silversmithing and beading. She runs fun craft activities for children with Albion Kids' Club, as well as adult education classes in the Borough. She never gives up and she always gives 100% of her enthusiasm in everything she does. This woman is my friend Samantha Parrington. She runs a Stay and Play Centre at the Bandstand, but also volunteers and helps young people who are in crisis, fleeing violence and abuse. She supports and fundraises for the Pilion Trust and The Crash Pad. She volunteers at the Food Bank and Quakers Shelters; she gives so much of not only her own time, but of herself, to help those less fortunate. I would like to express my thanks for her support and kindness by submitting her photograph for this exhibition. This is Clare Bartlett, Gillian Finbow, Karen Defoe, Heather Qualtrough and Natasha Chetwynd. It's not all Jam and Jerusalem! This is the East End Women's Institute - some of them, anyway. I joined a little while back, and would say it's one of the best ways to get to know a range of women in our community. The traditional image includes cakes and, of course, we do make cakes to fundraise for the group, as well as to provide community events with tasty, affordable treats. 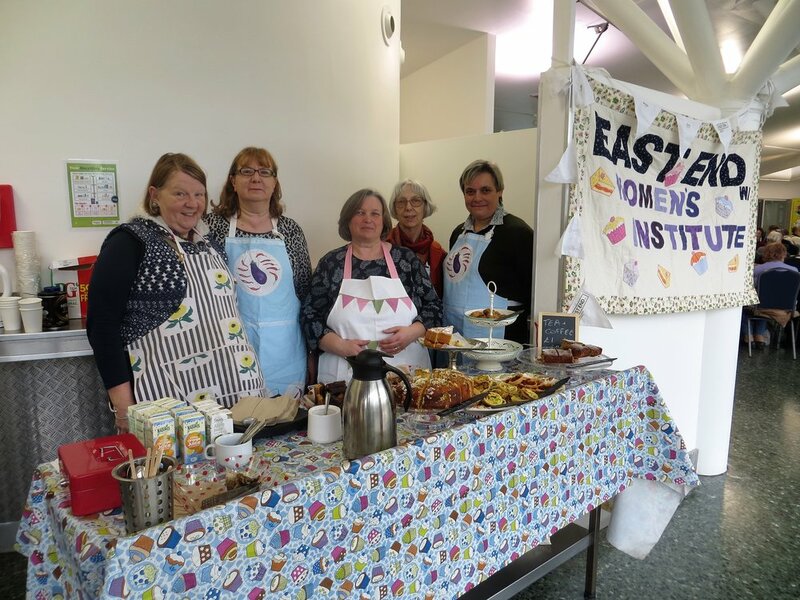 This picture was taken at the East End History Society's AGM where we provide tea and homemade cake throughout the day, to nearly 100 appreciative attendees. Monthly meetings at St Margaret's House cover a wide variety of activities and discussions. EEWI has links across our community and many members volunteer at food banks, theatre groups, St Joseph's Hospice, Foodcycle, Tate and Growing Concerns amongst others. If you need something done, ask a busy woman! Charlotte Wiseman launched Step Inside Wellbeing, an East London business targeted at helping people thrive in their everyday lives. Working with Charlotte as she launched her business was an inspiring experience and her positivity and commitment to improving the lives of others is something to be celebrated. This is Gabby Edlin, Founder of Bloody Good Period. Launched in 2016, Bloody Good Period works to provide sanitary protection for asylum seekers, refugees and those who cannot afford them. She is also a freelance creative consultant specialising in gender equality and a practicing artist. She is brilliant - a true role model. Chantal Joffe is a portrait artist based in East London, home to both her family and studio. Her subject is people - family, friends and recently, the diverse Whitechapel community. Large scale, collage-based portraits by Chantal depicting local residents will soon line the platforms of Crossrail’s new Whitechapel station, reflecting on wider migration from international communities into the East End and onwards into London. I have always admired her self-portraiture as utterly fearless in its depiction of her own body, yet she is one of the most self-effacing people I know. Different parts of our lives reveal such conflicting identities, yet don’t often meet. I wanted to capture the intimacy of her studio, quiet moments surrounded by the weight of her work. She has never created any public art in her life, yet her work is about to be seen by millions. Asma Shah is the Founder and CEO of You Make It (YMI). She grew up in Peckham and latterly the East End. Whilst developing her career within the creative and cultural sectors, it was witnessing the devastating effects of austerity and the impact of gentrification on local residents that motivated Asma to make a change. YMI empowers young unemployed women with the confidence, skills, networks, knowledge, and experiences needed to realise their passions and pursue their goals. YMI’s holistic and uplifting approach to job-seeking puts individuality and self-esteem at its core, ensuring that all women, regardless of background, have access to the same opportunities to lead happy, independent and fulfilled lives. To date, YMI has worked with 155 women, of whom 82% have gone into work, education or developed their own start-ups. Whilst 87% of participants started the programme on benefits, YMI is proud that just 19% currently still are. After completing the programme, 72% feel more confident and most importantly, 81% report feeling happier! Asma is also on the board of trustees for the Arts Council NPO, People’s Palace Projects, and Oxford House. This is my grandma Vera. Born in 1919, above the Queen's Head pub on the corner of Brady Street and the Whitechapel Road, she is now 99 years old. In the 1930s she moved to Watney Street where her parents had a shop. When she was young, she canvassed for George Lansbury – the East End social reformer – alongside her parents. In her spare time, she loved playing table tennis at the Brady Club, a Jewish youth group in Hanbury Street. At request of Father John Groser (the Vicar of Christchurch, Watney Street) she and her mother, a seamstress, made clothes for poor girl’s confirmation. In her old age, she enjoys reminiscing about the East End and her old haunts. The woman in the picture is my god-sister, Olivia Georgia Warren, aged 22. I have submitted this photograph of her, as she is an aspiring actor who inspires and encourages myself and many other young girls around London. 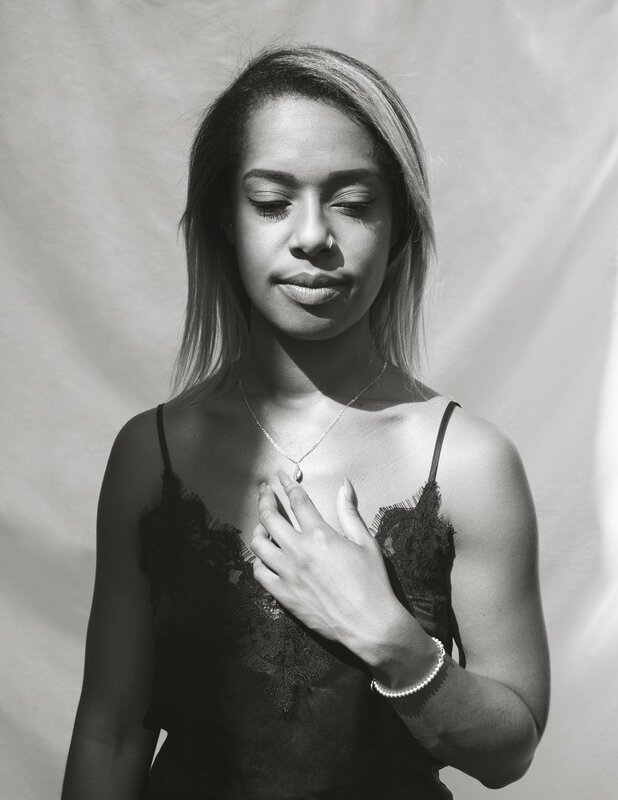 She has written plays and poems about self-love, eating disorders and depression - just a few of the issues so many of us young girls suffer from today. These are the health conditions Olivia has lived through, and is why I find it so inspiring that she turns her negative experience into a positive story to share. By sharing her own experiences with others, Olivia has opened forums for young women to talk about the issues that that affect us all. I have chosen to portray Katja Rosenberg, an inspiring woman from Germany who lives in Walthamstow. She has contributed to the artist and local community in London, and especially in East London, for the last 10 years. She founded Art Catcher Ltd., a platform that she uses to organise and curate exhibitions about a broad spectrum of topics. This photo was taken at The Art Pavilion in Mile End Park, because it is the first place where I took part in one of the group shows and because the venue is dedicated to the arts. I chose to photograph the women who run the wonderful Cranbrook Community Food Garden in Bethnal Green. 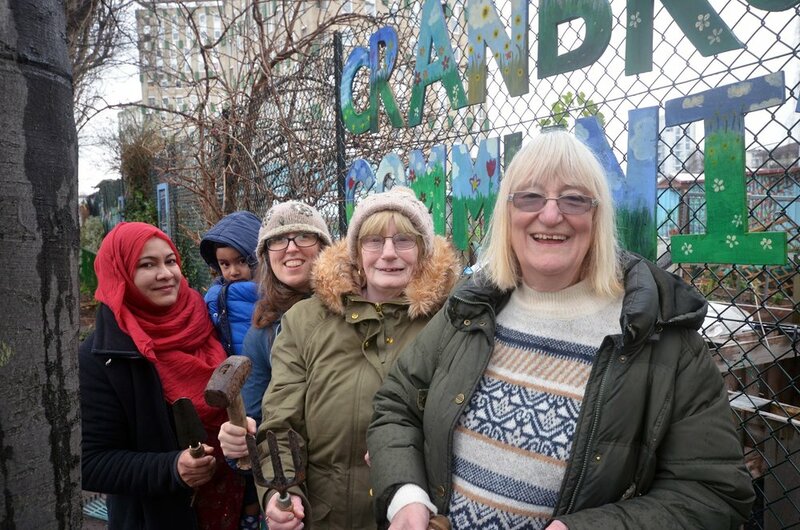 The garden was founded by Cranbrook Estate residents in 2009 and has won several awards. Pictured here are half of the all-female committee who work hard to maintain the garden. They run lots of public events through the year, bringing members of the estate's diverse community together in celebration of local food, green spaces and outdoor living. Janet was recently named Community Champion at Tower Hamlets Homes Outstanding Contribution to the Community Awards. Eileen can be found whizzing round the garden come rain or shine – the resident dynamo! Farzana is introducing her two children to the benefits of growing their own food. During the summer, Lizzy and Eileen spend hours making rhubarb jam and tomato chutney which visitors can buy in return for a donation. Thanks to their time, energy and love, their corner of Bethnal Green is a brighter, greener and friendlier place to be. Tania and Patch are part of a photography series I am working on, photographing dog walkers in Tower Hamlets Cemetery. If you live in Mile End, you have probably seen Tania and Patch around. Tania is an incredibly friendly neighbour who organises many of the local community charity events and won a Tower Hamlets STAR award last year. She is always there to help a neighbour in need! The woman I would like to remember and celebrate is the late Spitalfields-based artist Polly Hope, who I had the enormous pleasure of working with for 10 years. This was the last picture I took of Polly, in the office of her Heneage Street workshop where we spent so much time together. 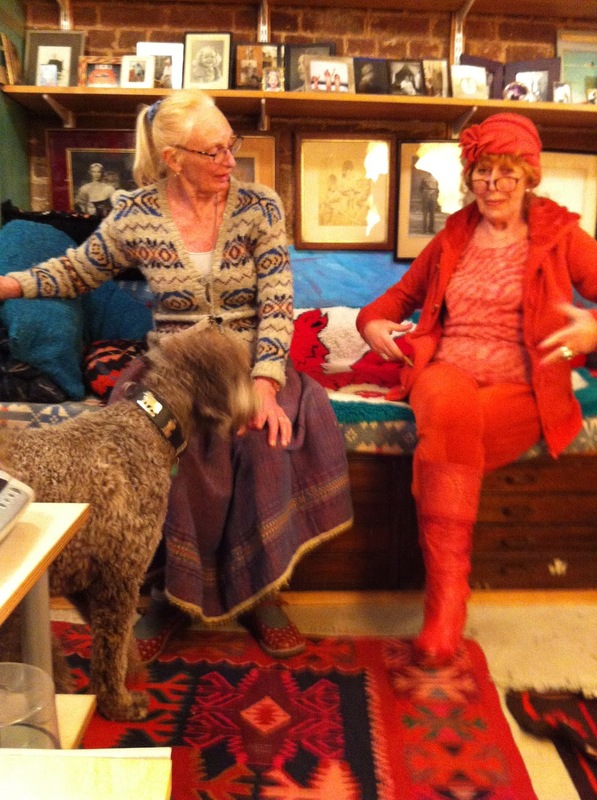 In this photo Polly, on the left, is chatting away with one of the many guests that visited the studio on a daily basis, next to Romeo, the poodle. The site was one of the little breweries put up in the 1840s to get the rookeries off gin and onto beer. A founder member of the Spitalfields Society, she was very much dedicated to local community. In her own words: “I decided it was time to do some community work, so I got everyone involved. Even those who couldn’t sew for toffee apples counted sequins for me. I did all the design and oversaw the work." This is the fierce and feisty June, outside of her home by Victoria Park - she has been a framer on Broadway Market, working with many of the area's leading artists for over 20 years. This photo was taken at June's house on the day she cooked for us for the Grand Dishes project - a cookbook of time-perfected recipes and stories from grandmothers from all over the world. This is the lovely Tigger - she has helped run the homeless shelter in Hackney for many years and is a steadfast member of the East London community. She has sixteen grandkids - all living in East London - and lived in Uganda for many years before moving back to her home in London. This photo was taken at Tigger's dining room table on the day she cooked for us for the Grand Dishes project - a cookbook of time perfected recipes and stories from grandmothers from all over the world. This photograph shows Hafiza, one of Juta Shoes’ bespoke shoemakers leading a shoe-making workshop in London Fields. Juta Shoes is a women’s social enterprise based in St. Hilda’s East Community Centre in Bethnal Green. It’s more than just a business – it’s a supportive, empowering and creative community. Juta Shoes offers fulfilling work that fits in with their family commitments, earning a London Living Wage while doing so. The more confident among them, like Hafiza, now lead shoe-making workshops all over London. I am fascinated by their eco-friendly approach to shoe-making. Their work contributes to the reduction of the environmental impact of leather in landfill as well as prolonging the usable life of leather products, which can be carbon-intensive to produce. All of Juta Shoes’ products use reclaimed leather from local factories which would otherwise have gone to landfill. you can see the top fifteen photographs in print up on the Gallery Cafe walls throughout March!